Asian Art Now is the online gallery of Pacific Bridge Contemporary Southeast Asian Art, a gallery and artist exchange program located in Oakland, California, founded to make the contemporary art of Southeast Asia accessible to an American audience. Pacific Bridge aims to create a cultural bridge between the peoples of the East and West by offering people in the West an opportunity to experience the art, and interact with artists from Southeast Asia. Pacific Bridge seeks to increase the audiences' understanding and appreciation of the sophistication and vitality of the peoples and cultures of the Southeast Asian region. Pacific Bridge offers artists from Southeast Asia an opportunity to experience life in the United States as artists-in-residence, allowing them to interact with American artists, explore American culture and create new work. An aspect of the artists experience during these visits is to have an exhibition of their work at Pacific Bridge. Bringing artists to the Bay Area creates an opportunity for new friendships and allows all involved to better understand each other's respective cultures and countries. Pacific Bridge was founded by Geoff Dorn and Beth Gates upon settling in the Bay Area after two years of living and traveling throughout Southeast Asia. Geoff Dorn and Beth Gates each have degrees in International Studies and certificates in both NGO Management and Rural Development. Between them they have lived in and traveled to over three dozen countries throughout the world. The mission of Pacific Bridge is to promote cultural understanding. 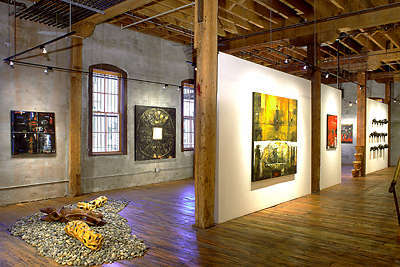 The artists exchange program and exhibitions are the primary tools used for reaching this goal. 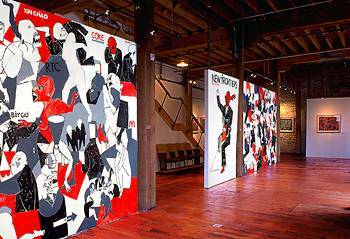 The sale of art from exhibitions is the primary funding source for these activities. Pacific Bridge is currently closed as we search for a new location. Although Pacific Bridge is not currently maintaining a gallery space, we are continuing to promote contemporary Asian art and the Bay Area art scene by pursuing new projects.